A complete guide to standing on your hands! Over 100 pages of warmups, full body strengtheners, alignment cues, and more. From myths about handstands to proper alignment and anatomy by body part, this book contains everything I used and continue to use on my handstand journey. Ideal for yogis, calisthenics enthusiasts, aerial arts practitioners, functional fitness fanatics, acrobats in training, and anyone interested in progressing their inversion practice! Hundreds of high quality photos, detailed instructions, and MORE! WOW I am so happy with this book!! I love the format, I had no idea how much I would love reading the instructions, Stephanie’s book feels like having a conversation about handstands! I am building my way through the book and love all the strength building and that its at my own pace. Thank you sooo much for all the hard work and authenticity put in this guide!! This book is great! I definitely feel more control in my handstands and more strength in my core! I love the warmup exercises and flows so much that I put them into my daily yoga routine even if I’m not doing handstands that day. The pictures and captions are laid out very nicely, so it’s easy to understand what to do and how to do it. I was at a but of a stalemate with my handstands, and this book brought new information into my practice that is helping me improve. I’d recommend this book to anyone wanting to improve balance, strength, and handstand abilities! This book has helped so much in my handstand journey! The proper alignment tips/drills as well as core engagement and learning how to fall out of a handstand have helped immensely! The tuck jumps especially helped me find my alignment and center of gravity. Highly recommend this book! Love the information in this book!! The tips were definitely helpful. There were drills that haven’t heard of. I like that you share your journey and struggles with handstands. I know I’m not alone but it’s nice to see and hear that I’m not alone with this skill. It is one we all can improve on. Thank you! I’ve been very resistant to buying Instagram ebooks because I feel a lot of the info is out there, if you take the time to look for it. This is the first yoga ebook I have ever bought and I am super glad I did. While it has a lot of info that is circulating on Insta, it addresses many questions I have had for a long time, yet never knew who to ask. My favorite part of the book is the “Myths About Handstands.” That alone helped me so much. Couple that with several other clear, easy to follow techniques and I have started getting some serious hang time. The best part is that it doesn’t feel lucky. It feels very intentional and on purpose. I have serious excitement about my handstanding future! Thanks, Steph! Really loved this ebook and enjoyed the colourful pics mixed in with the instructional pics! I also really loved the referencing to all the yogis that you’ve learnt from – I thought that was really awesome and such a beautiful way to honour all the teachers that have come before. The drills are all really awesome and can’t wait to put them into practice! Thank you Steph! I couldn’t wait to get my e-hands on this e-book. I’ve been a huge fan of Steph’s since I first discovering Instagram yoga and one thing I’ve always especially admired her handstanding abilities. I was so excited when she came out with this book to share her tips. I love it because I can always go back to it to add new things to my practice to continue to strengthen and improve. I have especially found the wrist exercises and hand placement diagrams useful as I have sensitive wrists and really need to be attentive to them in handstand practice. I would highly recommend this book to anyone looking to start or advance their handstand practice. Can’t wait to see what else Steph has in store!! So glad I bought this e-book! I was eagerly awaiting it for awhile as I’ve been admirer of Steph’s practice since I got serious about yoga and particular her inversion practice. I’ve already seen so much progress with my handstand practice since incorporating her tips and drills! Thanks Steph! Can’t wait to see what you put out next! This book is amazIng. I’ve read through it many time now and I find something new every single time. I’ve started holding handstands straighter and with more confidence thank to this book. The drills are well explained for every level. Absolutely The best handstand book I’ve ever owned!! I couldn’t be more happy with my purchase of The Beginner’s Guide to Handstand. As much as I would love to attend special workshops on the topic, I cannot always afford to. So, this ebook is my personal workshop. I always wondered if it would be okay to turn my hands out, if I should be wrapping my triceps forward, whether using a wall was my best option, what kind of drills were best for building strength, etc., and I began to feel like these unanswered questions were definitely inhibiting my progress. Well, these questions and more are answered in depth and with incredibly helpful photographic guides. I no longer feel stuck in my uncertainties and know the proper steps to take in order to handstand with confidence and with patience in myself knowing I’m on the right track!! I have seen much improvement in my overall practice since working Steph’s drills into my practice and, another HUGE help, are all the great wrist warm-ups, which I have learned are crucial to a safe and steady handstand practice. 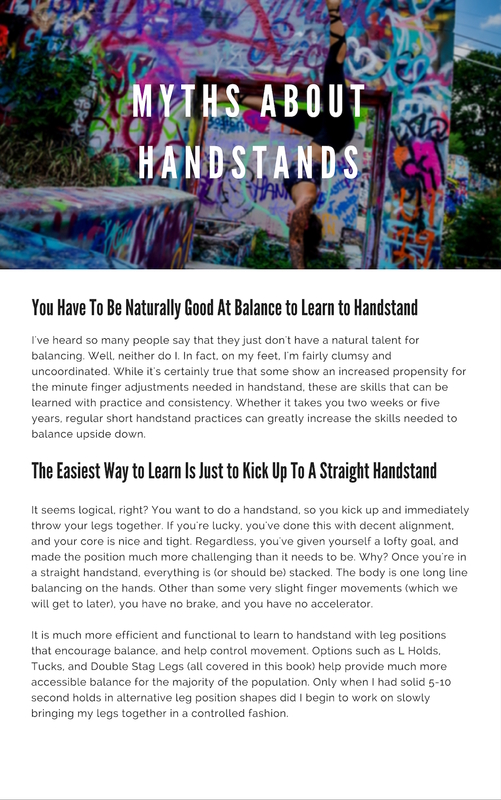 Thank you & go get yourself The Beginner’s Guide to Handstand!!!!! ???????????? This is such a beautifully presented ebook, filled with incredibly descriptive words and pictures making everything so clear. There are loads and loads of drills to build strength and help you on the journey to hand standing. There are several flows in there to help you practice or you can come up with your own sequence, it’s so versatile. Although I still haven’t gotten my handstand I certainly feel like I’m closer than I was before I bought this! As a hom practitioner/yoga newbie on a handstand journey, tips are a major! I’ve used almost all of the drills and have learned how to incorporate my handstand work into what I do daily in yoga. If you are used to book learning and don’t have any help like me, this Ebook is for you! Can’t attest to the partner work, but my husband will have to stand in at some point…Love it, thanks for your hard Work! 1.5 months ago my handstands were all over the place. My arms were unstable, my drishti was here, there and everywhere and my banana back was crazy! Now I feel more strong and know what I need to focus and improve on. I’ve purchased so many ebooks and read and watched so many different instructions on how to get into a handstand but none of them were as helpful and as beautifully presented and explained as The Beginners Guide to Handstands. Thanks Steph! When I first came across Steph on Instagram, I thought “If there was anyone to learn handstands from, this woman would be the Holy Grail.” Then lo and behold, she came out with her Beginner’s Guide to Handstand. I immediately snapped that up. I couldn’t be happier that I did because this book is FULL of so much quality info to begin/strengthen your handstand journey. I LOVE the warm-up/strengthening exercises. Steph’s tips are very descriptive and clear. I especially love her photos, which further clarify points she is making. I feel like the length of the ebook is awesome as well! So worth the price. I’ve noticed improvements in my handstand already with the help from her book. I fully intend on buying her pressing into handstand book as well, and anxiously await her guide to your own home yoga practice because Steph’s flows are also something I aspire to 🙂 Basically, if this woman wrote it, I’ll buy it because I know her ebooks are QUALITY – both in info and presentation. This book is absolutely worth reading. Steph’s writing style is clear and accessible, as she breaks down concepts and processes in simple language and step-by-step instructions. The photos included alongside instructions are super helpful supplements to further understanding the tips and guidelines laid out. Because of this book, I’m now reading her handstand press book, and will then read her guide to starting a home yoga practice once that’s out. This book is fantastic! You can tell so much work had gone into this book. Everything you need to start your Handstand journey is in this book. Clear instructions and photos, I highly recommend. I love it! It’s easy to understand, full of tips and useful images; thanks to this book I managed to hold my first handstand, a dream!! And I still have a lot to learn from this book. Recommended! To all of you wondering whether or not this book is worth every cent. It 110% is. Steph has poured out her love and bountiful knowledge of handstands, warm-ups, strengthening drills and covers topics from acknowledging your fears and safely falling out of handstand. Yes. Steph is a badass when it comes to not holding it back and giving it her all. This a 100+ page book for $25 for crying out loud!!! I am so in love with all that is offered in this book and I can’t wait to move onto her next. This. Is. The. Real.